Improving user adoption and success in a contact and customer management project involves providing various educational resource options. Our clients tell us that our implementations which include a pilot team phase helps to clarify the why of ACT! and the defined operational processes needed for all the end users for a successful roll-out. Depending on your organization and the learning styles of your ACT! users we can craft an educational program that is a combination of on-site face-to-face with hands on access, go to webinars, anytime learning using customized videos specific to your business, and anytime learning through ACT Training resources. Visit our ACT video and tours page. There are over 20 blog articles on ACT Tips and Tricks available. Our ACT! certified consultants work with you to get the most out of the ACT CRM based on your specific business needs. Increase sales, conversions, and maximize ROI from your prospects by implementing customized ACT integrations and marketing automation. Give us a call 269-445-3001. 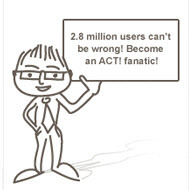 What is Act! Premium Cloud?